This spacious modern unit features 4 bedrooms spread over 3 floors with 3 balconies to take in the panoramic mountain and water views. Perfect for 2 families or a group. Free WiFi, Foxtel & Netflix at our apartment. Heating & cooling is provided by reverse cycle air conditioning with panel heaters in the bedrooms. There is also a drying room for your damp clothes. Park in the connected 2 car garage. No need to get out with remote controls. There is NO parking available for mini buses at this property. The light and airy living area features large screen TV. Coupled with this a Blue-Ray player and Surround Sound System makes your holiday a certain treat. STOP PRESS!....Torino 5 has a new kitchen for winter 2019! Your team were fantastic. I contacted them with questions prior to booking and they were in touch 24hrs before arrival to confirm bedding requirements & arrival time. Very friendly and helpful. 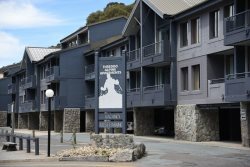 Jindabyne team have a great knowledge of the area and the properties they manage. What they say is what you get. They are a pleasure to deal with! Torino 5 was excellent for two families, well equipped with easy access to Kosciuszko Road and the shopping precinct. Have stayed with Snow Escape Holiday's with friends twice already and would do in the future. Love the views from this property. Deposit is required with booking, final & full payment is required 60 days before arrival date or your booking may be cancelled as an unpaid booking and could be re-booked by another guest. You will receive emails before this happens so please ensure that your email address is correct at all times.